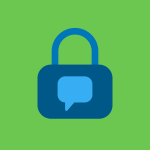 It’s no secret that messaging apps are the most commonly-used form of digital communication. 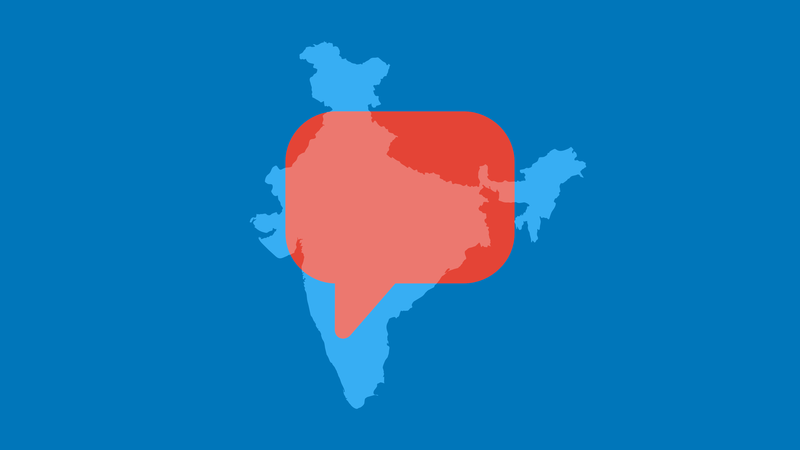 In this article, we’ll take a closer look at messaging app usage in a country with one of the fastest digital growth rates: India. People use WhatsApp, Facebook Messenger, Viber and a variety of other locally-loved apps to communicate with friends, family, send photos, videos and links — and in 2018, business communication over messaging apps have skyrocketed. 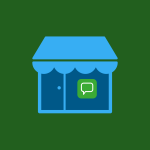 The majority of messaging apps (led by the WhatsApp Business API and Apple Business Chat) are offering businesses opportunities for both marketing and customer service. 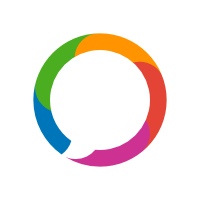 One of the main reasons that professional messenger communication is seeing such success is simply because messaging apps have enormous reach, globally. WhatsApp is the 3rd most popular social media worldwide, closely following Facebook and Youtube. And unlike Facebook and YouTube, communication over WhatsApp is completely personal and direct. While traditional social media has recently been plagued by privacy concerns, algorithms, and stagnating user numbers, messaging app usage is only growing. It’s a force to be reckoned with – and you can see this clearly from social data. Try your non-binding 14-day free trial now! India will remain an exciting and increasingly important market for mobile communications in 2019. Currently, every third person uses mobile payment and this number will certainly continue to rise as WhatsApp has started its own payment function in India. The release of Digital 2019, We are Social/Hoot Suite’s comprehensive global guide offers the latest data for messaging app usage in India. 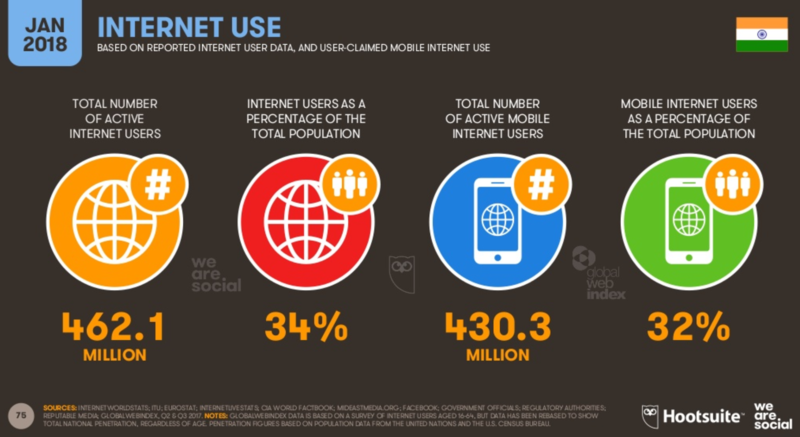 Compared to last year, the number of Internet users increased by 100 million to a total of 560 million. 89% of Internet users use messaging apps like WhatsApp, Facebook Messenger, Viber & Co.
WhatsApp is at the top of mobile apps among monthly active users. Facebook Messenger was the most downloaded app in 2018. India is an interesting digital market: it has seen incredible growth in the past years, and still has huge potential. Because of their growth patterns, the digital landscape in India has developed in a very specific, mobile-centric way. 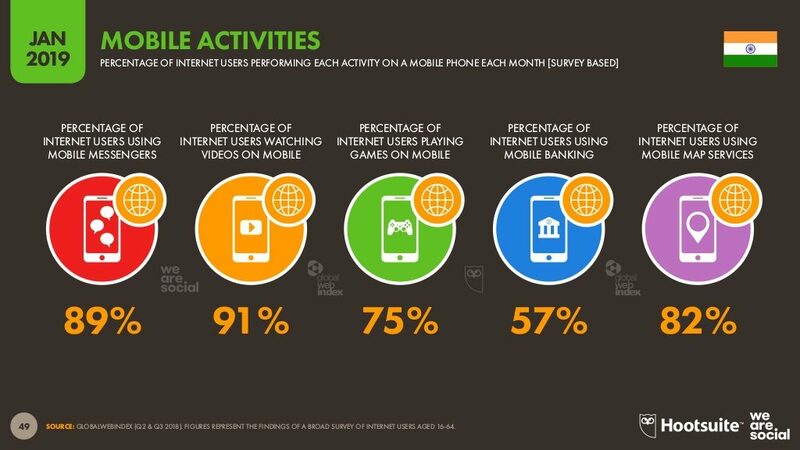 34% of the population uses the internet, and 32% of the population uses internet on a mobile device: the vast majority of Indian internet users are accessing it via mobile! Because mobile devices are so convenient, and users can carry them at all time, they have a serious impact on daily life. 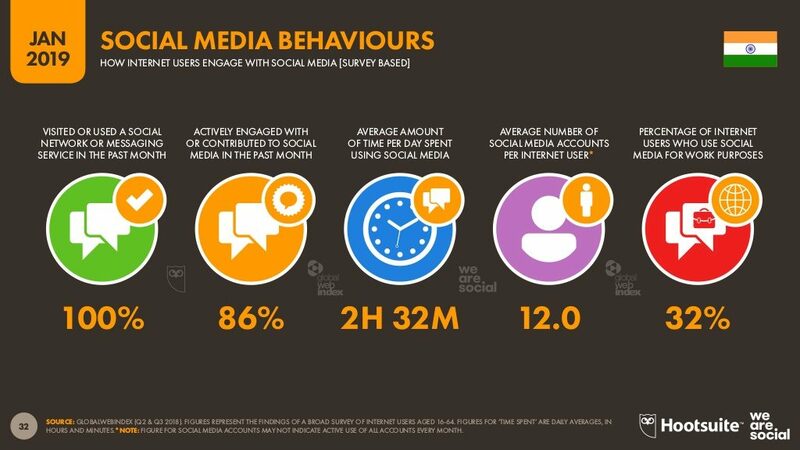 HootSuite and We are Social reports that 77% of all Indian internet users prefer to complete tasks digitally whenever possible, showing India’s high level of digital acceptance. 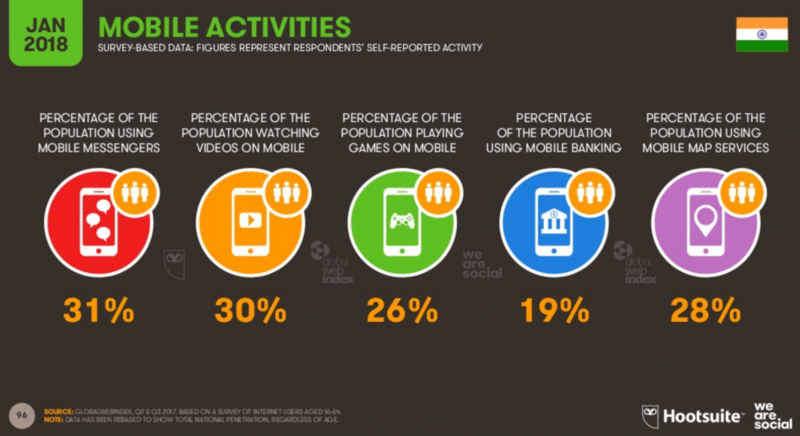 What is that 430.3 million Indian citizens are doing on their mobile devices? Primarily, messaging. 91% of Indian internet users use mobile messengers. This usage statistic actually ranks messaging apps as more highly-used than YouTube: watching videos on mobile is the 2nd place activity, followed by map services, playing games, and then mobile banking. Statista’s analysis from 2018 shows that WhatsApp is the social media application with by far the furthest reach, beating out Facebook, G-mail, Facebook Messenger, Instagram, and more. 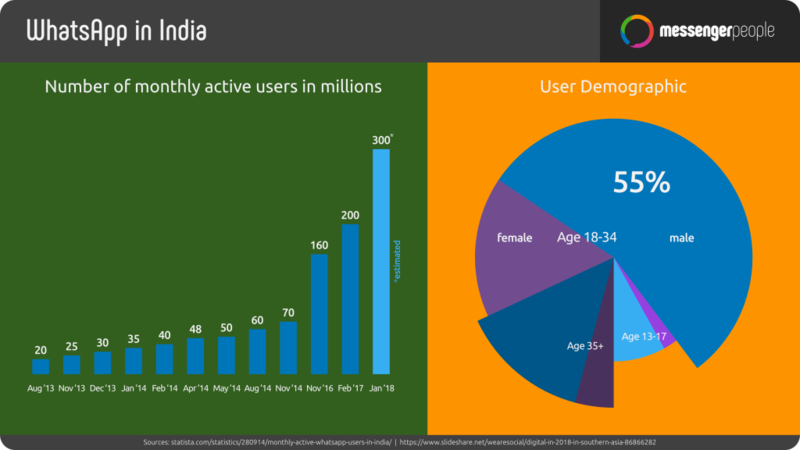 WhatsApp has 91.7% reach for social media application users in India. 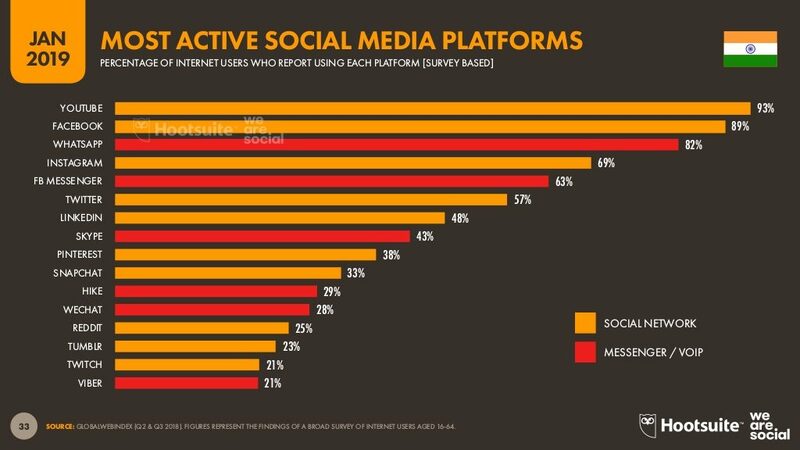 WeAreSocial also shows that by monthly active users, WhatsApp ranks 1st for top apps, followed by Facebook and Facebook Messenger. Instagram is the only other social network to make the top 10, rounding out the list in last place. For monthly downloads, the original Facebook platform takes the leads, with WhatsApp in 2nd place and Facebook Messenger in 4th place. 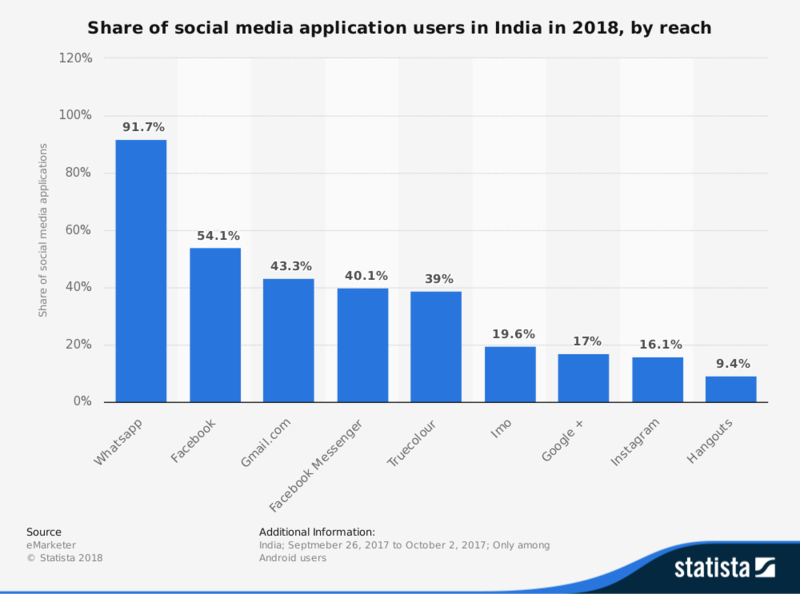 Similarweb has even more details about how popular WhatsApp is in India: “WhatsApp is installed on 95% of Android devices in India, where 75% of users use the app on a daily basis.” Interestingly, although the app Hike is “India’s first homegrown messaging app” (in its own words), in a Hootsuite/We are Social survey of Indian internet users about which social media platforms they use the most, Hike came in at 11th place, only beating out Snapchat, and with only about one-third the activity of WhatsApp. Not only are these WhatsApp usage statistics extremely impressive, but the number of messaging app users in India is steadily growing. In 2018, India boasted about 181.2 million WhatsApp users. Statista predicts that in 2020, there will be 230.5 million users — a 27% increase in 2 years! In the time span from 2015 (106.9 million WhatsApp users in India), the WhatsApp user base will have grown by 115% in five years. The Indian market is full of potential, and is definitely a digital landscape for businesses interested in messenger communication to keep their eye on. For more information about messenger marketing and customer service – tailored specifically to Indian businesses – download our free whitepaper! The ABCs about Chatbots: What is a WhatsApp Bot?